Looking for somewhere different to hold a wedding reception, meeting or corporate event? You can hire rooms or the whole site for your own special event. As weddings are booked on days when we have no events being run you can be sure that your special day isn’t one of many being held that week and that museum staff will make you and your guests feel welcome. Contact the museum for an information sheet. 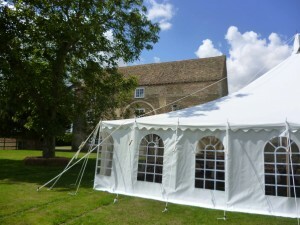 For a DIY wedding reception you supply a marquee (weighted not pegged), the tables, chairs, catering and entertainment – we’ll supply the fantastic rural location! The site is also a great location for a DIY family party or corporate event. Please contact us for more information. The Education Room is a perfect meeting room available for hire throughout the year at very competitive rates. Use it to hold a training event, a meeting or a talk. It also makes a great room for art groups who’d like to be together in an inspirational location for a workshop. If you’d like to spread your meeting over two rooms you also have the choice of two other spaces which we’re happy to show you on request. Cold buffet or sandwich lunches can be arranged for an additional charge. Please call the Museum Manager on 01223 860988 to discuss your requirements and our rates for room hire.